This article is about the wider region in the Pacific. For the French collectivity, see French Polynesia. For the genus of moth, see Polynesia (moth). For point of land in the South Orkney Islands, see Polynesia Point. For other uses, see Polynesian (disambiguation). Polynesia (UK: /ˌpɒlɪˈniːziə/, US: /-ʒə/; from Greek: πολύς polys "many" and Greek: νῆσος nēsos "island"; French: Polynésie, Spanish: Polinesia, Samoan: Polenisia, Māori: Poronēhia or Poronihia) is a subregion of Oceania, made up of more than 1,000 islands scattered over the central and southern Pacific Ocean. The indigenous people who inhabit the islands of Polynesia are termed Polynesians, and share many similar traits including language family, culture, and beliefs. Historically, they had a strong tradition of sailing and using stars to navigate at night. The largest country in Polynesia is New Zealand. The term Polynesia was first used in 1756 by a French writer named Charles de Brosses, and originally applied to all the islands of the Pacific. In 1831, Jules Dumont d'Urville proposed a restriction on its use during a lecture to the Geographical Society of Paris. Historically, the islands of the South Seas have been known as South Sea Islands, and their inhabitants as South Sea Islanders, even though the Hawaiian Islands are located in the North Pacific. Another term, the Polynesian Triangle, explicitly includes the Hawaiian Islands, as they form its northern vertex. Polynesia is characterized by a small amount of land spread over a very large portion of the mid and southern Pacific Ocean. Most Polynesian islands and archipelagos, including the Hawaiian Islands and Samoa, are composed of volcanic islands built by hotspots (volcanoes). New Zealand, Norfolk Island, and Ouvéa, the Polynesian outlier near New Caledonia, are the unsubmerged portions of the largely sunken continent of Zealandia. Zealandia is believed to have mostly sunk 23 million years ago and recently resurfaced geologically due to a change in the movements of the Pacific Plate in relation to the Indo-Australian plate, which served to uplift the New Zealand portion. At first, the Pacific plate was subducted under the Australian plate. The Alpine Fault that traverses the South Island is currently a transform fault while the convergent plate boundary from the North Island northwards is called the Kermadec-Tonga Subduction Zone. The volcanism associated with this subduction zone is the origin of the Kermadec and Tongan island archipelagos. Out of approximately 300,000 or 310,000 square kilometres (117,000 or 118,000 sq mi) of land, over 270,000 km2 (103,000 sq mi) are within New Zealand; the Hawaiian archipelago comprises about half the remainder. The Zealandia continent has approximately 3,600,000 km2 (1,400,000 sq mi) of continental shelf. The oldest rocks in the region are found in New Zealand and are believed to be about 510 million years old. The oldest Polynesian rocks outside of Zealandia are to be found in the Hawaiian Emperor Seamount Chain and are 80 million years old. Polynesia is generally defined as the islands within the Polynesian Triangle, although some islands inhabited by Polynesian people are situated outside the Polynesian Triangle. Geographically, the Polynesian Triangle is drawn by connecting the points of Hawaii, New Zealand, and Easter Island. The other main island groups located within the Polynesian Triangle are Samoa, Tonga, the Cook Islands, Tuvalu, Tokelau, Niue, Wallis and Futuna, and French Polynesia. Also, small Polynesian settlements are in Papua New Guinea, the Solomon Islands, the Caroline Islands, and Vanuatu. An island group with strong Polynesian cultural traits outside of this great triangle is Rotuma, situated north of Fiji. The people of Rotuma have many common Polynesian traits, but speak a non-Polynesian language. Some of the Lau Islands to the southeast of Fiji have strong historic and cultural links with Tonga. However, in essence, Polynesia is a cultural term referring to one of the three parts of Oceania (the others being Micronesia and Melanesia). The following are the islands and island groups, either nations or overseas territories of former colonial powers, that are of native Polynesian culture or where archaeological evidence indicates Polynesian settlement in the past. Some islands of Polynesian origin are outside the general triangle that geographically defines the region. American Samoa Unincorporated and unorganized territory of the US; self-governing under supervision of the Office of Insular Affairs, US Department of the Interior. The Phoenix Islands and Line Islands, most of which are part of Kiribati, had no permanent settlements until European colonization, but are sometimes considered to be inside the Polynesian triangle[citation needed]. In pre-colonial times, Polynesian populations also existed in the Kermadec Islands, the Auckland Islands and Norfolk Island. However, when European explorers arrived, these islands were uninhabited. The Polynesian people are considered to be by linguistic, archaeological and human genetic ancestry a subset of the sea-migrating Austronesian people. Tracing Polynesian languages places their prehistoric origins in the Malay Archipelago, and ultimately, in Taiwan. Between about 3000 and 1000 BCE speakers of Austronesian languages began spreading from Taiwan into Island Southeast Asia. Express Train model: A recent (c. 3000–1000 BCE) expansion out of Taiwan, via the Philippines and eastern Indonesia and from the northwest ("Bird's Head") of New Guinea, on to Island Melanesia by roughly 1400 BCE, reaching western Polynesian islands around 900 BCE. This theory is supported by the majority of current genetic, linguistic, and archaeological data. Entangled Bank model: Emphasizes the long history of Austronesian speakers' cultural and genetic interactions with indigenous Island Southeast Asians and Melanesians along the way to becoming the first Polynesians. Slow Boat model: Similar to the express-train model but with a longer hiatus in Melanesia along with admixture, both genetically, culturally and linguistically with the local population. This is supported by the Y-chromosome data of Kayser et al. (2000), which shows that all three haplotypes of Polynesian Y chromosomes can be traced back to Melanesia. In the archaeological record there are well-defined traces of this expansion which allow the path it took to be followed and dated with some certainty. It is thought that by roughly 1400 BCE, "Lapita Peoples", so-named after their pottery tradition, appeared in the Bismarck Archipelago of northwest Melanesia. This culture is seen as having adapted and evolved through time and space since its emergence "Out of Taiwan". They had given up rice production, for instance, after encountering and adapting to breadfruit in the Bird's Head area of New Guinea. The results of research at the Teouma Lapita site (Efate Island, Vanuatu) and the Talasiu Lapita site (near Nuku'alofa, Tonga) published in 2016 supports the Express Train model; although with the qualification that the migration bypassed New Guinea and Island Melanesia. The conclusion from research published in 2016 is that the initial population of those two sites appears to come directly from Taiwan or the northern Philippines and did not mix with the ‘AustraloPapuans’ of New Guinea and the Solomon Islands. The preliminary analysis of skulls found at the Teouma and Talasiu Lapita sites is that they lack Australian or Papuan affinities and instead have affinities to mainland Asian populations. DNA analysis of modern Polynesians indicates that there has been intermarriage resulting in a mixed Asian-Papuan ancestry of the Polynesians. Research at the Teouma and Talasiu Lapita sites implies that the migration and intermarriage, which resulted in the mixed Asian-Papuan ancestry of the Polynesians, occurred after the first initial migration to Vanuatu and Tonga. The most eastern site for Lapita archaeological remains recovered so far is at Mulifanua on Upolu. The Mulifanua site, where 4,288 pottery shards have been found and studied, has a "true" age of c. 1000 BCE based on C14 dating. A 2010 study places the beginning of the human archaeological sequences of Polynesia in Tonga at 900 BCE. Tiny populations may have been involved at first;[clarification needed] although Professor Matisoo-Smith of the Otago study said that the founding Māori population of New Zealand must have been in the hundreds, much larger than previously thought. The Polynesians were matrilineal and matrilocal Stone Age societies upon arrival in Fiji, Tonga and Samoa, after having been through at least some time in the Bismarck Archipelago. The modern Polynesians still show human genetic results of a Melanesian culture which allowed indigenous men, but not women, to "marry in" – useful evidence for matrilocality. Atholl Anderson wrote that analysis of mtDNA (female) and Y chromosome (male) concluded that the ancestors of Polynesian women came from Taiwan while those of Polynesian men came from New Guinea. Subsequently, it was found that 96% of Polynesian mtDNA has an Asian origin, as does one-third of Polynesian Y chromosomes; the remaining two-thirds from New Guinea and nearby islands; this is consistent with matrilocal residence patterns. Although matrilocality and matrilineality receded at some early time, Polynesians and most other Austronesian speakers in the Pacific Islands, were/are still highly "matricentric" in their traditional jurisprudence. The Lapita pottery for which the general archaeological complex of the earliest "Oceanic" Austronesian speakers in the Pacific Islands are named also went away in Western Polynesia. Language, social life and material culture were very distinctly "Polynesian" by the time Eastern Polynesia was being settled after a "pause" of 1000 years or more in Western Polynesia. After a bloody civil war, political power in Tonga eventually fell under the Tu'i Kanokupolu dynasty in the 16th century. In 1845 the ambitious young warrior, strategist, and orator Tāufaʻāhau united Tonga into a more Western-style kingdom. He held the chiefly title of Tuʻi Kanokupolu, but had been baptised with the name Jiaoji ("George") in 1831. In 1875, with the help of the missionary Shirley Waldemar Baker, he declared Tonga a constitutional monarchy, formally adopted the western royal style, emancipated the "serfs", enshrined a code of law, land tenure, and freedom of the press, and limited the power of the chiefs. Tonga became a British-protected state under a Treaty of Friendship on 18 May 1900, when European settlers and rival Tongan chiefs tried to oust the second king. Within the British Empire, which posted no higher permanent representative on Tonga than a British Consul (1901–1970), Tonga formed part of the British Western Pacific Territories (under a colonial High Commissioner, residing in Fiji) from 1901 until 1952. Despite being under the protectorate, Tonga retained its monarchy without interruption. On June 4, 1970 the Kingdom of Tonga received independence from the British protectorate. Samoa has a long history of various ruling families, the oldest of which is the Tui Manu'a, and the most recent of which is the Malietoa, until its East-West division by Tripartite Convention (1899) subsequent annexation by the German Empire and the United States. 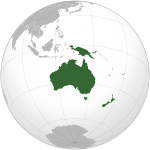 The German-controlled Western portion of Samoa (consisting of the bulk of Samoan territory) was occupied by New Zealand in WWI, and administered by it under a Class C League of Nations Mandate until receiving independence on January 1, 1962. The new Independent State of Samoa was not a monarchy, though the Malietoa title-holder remained very influential. It officially ended, however with the death of Malietoa Tanumafili II on May 11, 2007. Using the Treaty of Waitangi and right of discovery as a basis, the United Kingdom annexed New Zealand as a part of New South Wales in 1840. All tribes were incorporated into rule under the colonial government by the late 19th century. Although Māori were given the privilege of being legally enfranchised subjects of the British Empire under the Treaty, Māori culture and language (te reo Māori) were actively suppressed by the colonial government and by economic and social pressures from the Pakeha society. Efforts were made to preserve indigenous culture starting in the late 1950s and culminating in the Waitangi Tribunal's interpretation of language and culture being included in the treasures set to be preserved under the Treaty of Waitangi. Moving from a low point of 15,000 speakers in the 1970s, there are now over 157,000 people who have some proficiency in the standard Māori language according to the 2006 census in New Zealand, due in large part to government recognition and promotion of the language. The Lau islands were subject to periods of Tongan rulership and then Fijian control until their eventual conquest by Seru Epenisa Cakobau of the Kingdom of Fiji by 1871. In around 1855 a Tongan prince, Enele Ma'afu, proclaimed the Lau islands as his kingdom, and took the title Tui Lau. In 1873, Cakobau ceded a Fiji heavily indebted to foreign creditors to the United Kingdom. It became independent on 10 October 1970 and a republic on 28 September 1987. The Cook Islands is made up of 15 islands comprising the Northern and Southern groups. The islands are spread out across many kilometers of a vast ocean. The largest of these islands is called Rarotonga, which is also the political and economic capital of the nation. The Cook Islands were formerly known as the Hervey Islands, but this name refers only to the Northern Groups. It is unknown when this name was changed to reflect the current name. It is thought that the Cook Islands were settled in two periods: the Tahitian Period, when the country was settled between 900 - 1300 AD. The second settlement, the Maui Settlement, occurred in 1600 AD, when a large contingent from Tahiti settled in Rarotonga, in the Takitumu district. Cook Islanders are ethnically Polynesians or Eastern Polynesia. They are culturally associated with Tahiti, Eastern Islands, NZ Maori and Hawaii. Early in the 17th century, became the first race to settle in New Zealand. The reef islands and atolls of Tuvalu are identified as being part of West Polynesia. During pre-European-contact times there was frequent canoe voyaging between the islands as Polynesian navigation skills are recognised to have allowed deliberate journeys on double-hull sailing canoes or outrigger canoes. Eight of the nine islands of Tuvalu were inhabited; thus the name, Tuvalu, means "eight standing together" in Tuvaluan. The pattern of settlement that is believed to have occurred is that the Polynesians spread out from Samoa and Tonga into the Tuvaluan atolls, with Tuvalu providing a stepping stone for migration into the Polynesian Outlier communities in Melanesia and Micronesia. Stories as to the ancestors of the Tuvaluans vary from island to island. On Niutao, Funafuti and Vaitupu the founding ancestor is described as being from Samoa; whereas on Nanumea the founding ancestor is described as being from Tonga. The extent of influence of the Tuʻi Tonga line of Tongan kings, which originated in the 10th century, is understood to have extended to some of the islands of Tuvalu in the 11th to mid-13th century. The oral history of Niutao recalls that in the 15th century Tongan warriors were defeated in a battle on the reef of Niutao. Tongan warriors also invaded Niutao later in the 15th century and again were repelled. A third and fourth Tongan invasion of Niutao occurred in the late 16th century, again with the Tongans being defeated. Fishing was the primary source of protein, with the cuisine of Tuvalu reflecting food that could be grown on low-lying atolls. Navigation between the islands of Tuvalu was carried out using outrigger canoes. The population levels of the low-lying islands of Tuvalu had to be managed because of the effects of periodic droughts and the risk of severe famine if the gardens were poisoned by salt from the storm-surge of a tropical cyclone. The sweet potato, called kūmara in Māori and kumar in Quechua, is native to the Americas and was widespread in Polynesia when Europeans first reached the Pacific. Remains of the plant in the Cook Islands have been radiocarbon-dated to 1000, and current thinking is that it was brought to central Polynesia c. 700 and spread across Polynesia from there, possibly by Polynesians who had traveled to South America and back. Thor Heyerdahl proposed in the mid-20th century that the Polynesians had migrated from the northwest coast of Canada by large whale-hunting dugouts, and from South America on balsa-log boats. Many anthropologists have criticised Heyerdahl's theory, including Wade Davis in his book The Wayfinders. Davis says that Heyerdahl "ignored the overwhelming body of linguistic, ethnographic, and ethnobotanical evidence, augmented today by genetic and archaeological data, indicating that he was patently wrong." Polynesia divides into two distinct cultural groups, East Polynesia and West Polynesia. The culture of West Polynesia is conditioned to high populations. It has strong institutions of marriage and well-developed judicial, monetary and trading traditions. It comprises the groups of Tonga, Niue, Samoa and extends to the atolls of Tuvalu to the north. The pattern of settlement that is believed to have occurred is that the Polynesians spread out from the Samoan Islands into the Tuvaluan atolls, with Tuvalu providing a stepping stone to migration into the Polynesian Outlier communities in Melanesia and Micronesia. Eastern Polynesian cultures are highly adapted to smaller islands and atolls, principally the Cook Islands, Tahiti, the Tuamotus, the Marquesas, Hawaii, Rapa Nui and smaller central-pacific groups. The large islands of New Zealand were first settled by Eastern Polynesians who adapted their culture to a non-tropical environment. Unlike Melanesia, leaders were chosen in Polynesia based on their hereditary bloodline. Samoa, however, had another system of government that combines elements of heredity and real-world skills to choose leaders. This system is called Fa'amatai. According to Ben R. Finney and Eric M. Jones, "On Tahiti, for example, the 35,000 Polynesians living there at the time of European discovery were divided between high-status persons with full access to food and other resources, and low-status persons with limited access." Religion, farming, fishing, weather prediction, out-rigger canoe (similar to modern catamarans) construction and navigation were highly developed skills because the population of an entire island depended on them. Trading of both luxuries and mundane items was important to all groups. Periodic droughts and subsequent famines often led to war. Many low-lying islands could suffer severe famine if their gardens were poisoned by the salt from the storm-surge of a tropical cyclone. In these cases fishing, the primary source of protein, would not ease loss of food energy. Navigators, in particular, were highly respected and each island maintained a house of navigation with a canoe-building area. Settlements by the Polynesians were of two categories: the hamlet and the village. The size of the island inhabited determined whether or not a hamlet would be built. The larger volcanic islands usually had hamlets because of the many zones that could be divided across the island. Food and resources were more plentiful. These settlements of four to five houses (usually with gardens) were established so that there would be no overlap between the zones. Villages, on the other hand, were built on the coasts of smaller islands and consisted of thirty or more houses—in the case of atolls, on only one of the group so that food cultivation was on the others. Usually these villages were fortified with walls and palisades made of stone and wood. However, New Zealand demonstrates the opposite: large volcanic islands with fortified villages. As well as being great navigators, these people were artists and artisans of great skill. Simple objects, such as fish-hooks would be manufactured to exacting standards for different catches and decorated even when the decoration was not part of the function. Stone and wooden weapons were considered to be more powerful the better they were made and decorated. In some island groups weaving was a strong part of the culture and gifting woven articles was an ingrained practice. Dwellings were imbued with character by the skill of their building. Body decoration and jewelry is of an international standard to this day. The religious attributes of Polynesians were common over the whole Pacific region. While there are some differences in their spoken languages they largely have the same explanation for the creation of the earth and sky, for the gods that rule aspects of life and for the religious practices of everyday life. People traveled thousands of miles to celebrations that they all owned communally. Beginning in the 1820s large numbers of missionaries worked in the islands, converting many groups to Christianity. Polynesia, argues Ian Breward, is now "one of the most strongly Christian regions in the world....Christianity was rapidly and successfully incorporated into Polynesian culture. War and slavery disappeared." Polynesian languages are all members of the family of Oceanic languages, a sub-branch of the Austronesian language family. Polynesian languages show a considerable degree of similarity. The vowels are generally the same—a, e, i, o, and u, pronounced as in Italian, Spanish, and German—and the consonants are always followed by a vowel. The languages of various island groups show changes in consonants. R and v are used in central and eastern Polynesia whereas l and v are used in western Polynesia. The glottal stop is increasingly represented by an inverted comma or ‘okina. In the Society Islands, the original Proto-Polynesian *k and *ng have merged as glottal stop; so the name for the ancestral homeland, deriving from Proto-Nuclear Polynesian *sawaiki, becomes Havai'i. In New Zealand, where the original *w is used instead of v, the ancient home is Hawaiki. In the Cook Islands, where the glottal stop replaces the original *s (with a likely intermediate stage of *h), it is ‘Avaiki. In the Hawaiian islands, where the glottal stop replaces the original k, the largest island of the group is named Hawai‘i. In Samoa, where the original s is used instead of h, v replaces w, and the glottal stop replaces the original k, the largest island is called Savai'i. With the exception of New Zealand, the majority of independent Polynesian islands derive much of their income from foreign aid and remittances from those who live in other countries. Some encourage their young people to go where they can earn good money to remit to their stay-at-home relatives. Many Polynesian locations, such as Easter Island, supplement this with tourism income. Some have more unusual sources of income, such as Tuvalu which marketed its '.tv' internet top-level domain name or the Cooks that relied on postage stamp sales. Tuilaepa Sailele Malielegaoi, Prime Minister of Samoa, who initiated the Polynesian Leaders Group in late 2011. The first major attempt at uniting the Polynesian islands was by Imperial Japan in the 1930s, when various theorists (chiefly Hachirō Arita) began promulgating the idea of what would soon become known as the Greater East Asia Co-Prosperity Sphere. Under the Greater East Asia Co-Prosperity Sphere, all nations stretching from Southeast and Northeast Asia to Oceania would be united under one, large, cultural and economic bloc which would be free from Western imperialism. The policy theorists who conceived it, along with the Japanese public, largely saw it as a pan-Asian movement driven by ideals of freedom and independence from Western colonial oppression. In practice, however, it was frequently corrupted by militarists who saw it as an effective policy vehicle through which to strengthen Japan's position and advance its dominance within Asia. At its greatest extent, it stretched from Japanese occupied Indochina in the west to the Gilbert Islands in the east, although it was originally planned to stretch as far east as Hawai'i and Easter Island and as far west as India. This never came to fruition, however, as Japan was defeated during World War II and subsequently lost all power and influence it had. After several years of discussing a potential regional grouping, three sovereign states (Samoa, Tonga and Tuvalu) and five self-governing but non-sovereign territories formally launched, in November 2011, the Polynesian Leaders Group, intended to cooperate on a variety of issues including culture and language, education, responses to climate change, and trade and investment. It does not, however, constitute a political or monetary union. Polynesia comprised islands diffused throughout a triangular area with sides of four thousand miles. The area from the Hawaiian Islands in the north, to Easter Island in the east and to New Zealand in the south were all settled by Polynesians. Navigators traveled to small inhabited islands using only their own senses and knowledge passed by oral tradition from navigator to apprentice. In order to locate directions at various times of day and year, navigators in Eastern Polynesia memorized important facts: the motion of specific stars, and where they would rise on the horizon of the ocean; weather; times of travel; wildlife species (which congregate at particular positions); directions of swells on the ocean, and how the crew would feel their motion; colors of the sea and sky, especially how clouds would cluster at the locations of some islands; and angles for approaching harbors. These wayfinding techniques, along with outrigger canoe construction methods, were kept as guild secrets. Generally each island maintained a guild of navigators who had very high status; in times of famine or difficulty these navigators could trade for aid or evacuate people to neighboring islands. On his first voyage of Pacific exploration Cook had the services of a Polynesian navigator, Tupaia, who drew a hand-drawn chart of the islands within 3,200 km (2,000 mi) radius (to the north and west) of his home island of Ra'iatea. Tupaia had knowledge of 130 islands and named 74 on his chart. Tupaia had navigated from Ra'iatea in short voyages to 13 islands. He had not visited western Polynesia, as since his grandfather's time the extent of voyaging by Raiateans has diminished to the islands of eastern Polynesia. His grandfather and father had passed to Tupaia the knowledge as to the location of the major islands of western Polynesia and the navigation information necessary to voyage to Fiji, Samoa and Tonga. As the Admiralty orders directed Cook to search for the “Great Southern Continent”, Cook ignored Tupaia's chart and his skills as a navigator. To this day, original traditional methods of Polynesian Navigation are still taught in the Polynesian outlier of Taumako Island in the Solomon Islands. A published, apparently pre-Columbian, Chilean specimen and six pre-European Polynesian specimens also cluster with the same European/Indian subcontinental/Southeast Asian sequences, providing no support for a Polynesian introduction of chickens to South America. In contrast, sequences from two archaeological sites on Easter Island group with an uncommon haplogroup from Indonesia, Japan, and China and may represent a genetic signature of an early Polynesian dispersal. Modeling of the potential marine carbon contribution to the Chilean archaeological specimen casts further doubt on claims for pre-Columbian chickens, and definitive proof will require further analyses of ancient DNA sequences and radiocarbon and stable isotope data from archaeological excavations within both Chile and Polynesia. Knowledge of the traditional Polynesian methods of navigation were largely lost after contact with and colonization by Europeans. This left the problem of accounting for the presence of the Polynesians in such isolated and scattered parts of the Pacific. By the late 19th century to the early 20th century a more generous view of Polynesian navigation had come into favor, perhaps creating a romantic picture of their canoes, seamanship and navigational expertise. In the mid to late 1960s, scholars began testing sailing and paddling experiments related to Polynesian navigation: David Lewis sailed his catamaran from Tahiti to New Zealand using stellar navigation without instruments and Ben Finney built a 12-meter (40-foot) replica of a Hawaiian double canoe "Nalehia" and tested it in Hawaii. Meanwhile, Micronesian ethnographic research in the Caroline Islands revealed that traditional stellar navigational methods were still in every day use. Recent re-creations of Polynesian voyaging have used methods based largely on Micronesian methods and the teachings of a Micronesian navigator, Mau Piailug. It is probable that the Polynesian navigators employed a whole range of techniques including use of the stars, the movement of ocean currents and wave patterns, the air and sea interference patterns caused by islands and atolls, the flight of birds, the winds and the weather. Scientists think that long-distance Polynesian voyaging followed the seasonal paths of birds. There are some references in their oral traditions to the flight of birds and some say that there were range marks onshore pointing to distant islands in line with these flyways. One theory is that they would have taken a frigatebird with them. These birds refuse to land on the water as their feathers will become waterlogged making it impossible to fly. When the voyagers thought they were close to land they may have released the bird, which would either fly towards land or else return to the canoe. It is likely that the Polynesians also used wave and swell formations to navigate. It is thought that the Polynesian navigators may have measured the time it took to sail between islands in "canoe-days’’ or a similar type of expression. Also, people of the Marshall Islands used special devices called stick charts, showing the places and directions of swells and wave-breaks, with tiny seashells affixed to them to mark the positions of islands along the way. Materials for these maps were readily available on beaches, and their making was simple; however, their effective use needed years and years of study. ^ a b Hiroa, Te Rangi (Sir Peter Henry Buck) (1964). Vikings of the Sunrise. NZ Electronic Text Centre, Victoria University, NZ Licence CC-BY-SA 3.0 (reprint ed.). Whitcombe and Tombs Ltd. p. 67. Retrieved 2 March 2010. ^ Russell, Michael (1849) Polynesia: A History of the South Sea Islands, Including New Zealand. ^ Islands that were uninhabited at contact but which have archaeological evidence of Polynesian settlement include Norfolk Island, Pitcairn, New Zealand's Kermadec Islands and some small islands near Hawaii. ^ O'Connor, Tom (2004). "Polynesians in the Southern Ocean: Occupation of the Auckland Islands in Prehistory". New Zealand Geographic. 69: 6–8. ^ Anderson, Atholl J. and O'Regan, Gerard R. (2000) "To the Final Shore: Prehistoric Colonisation of the Subantarctic Islands in South Polynesia", pp. 440–454 in Australian Archaeologist: Collected Papers in Honour of Jim Allen Canberra: Australian National University. ^ Anderson, Atholl (2005). "Subpolar Settlement in South Polynesia". Antiquity. 79 (306): 791–800. doi:10.1017/S0003598X00114930. ^ a b Hage, P.; Marck, J. (2003). "Matrilineality and Melanesian Origin of Polynesian Y Chromosomes". Current Anthropology. 44 (S5): S121. doi:10.1086/379272. ^ a b c d Kayser, M.; Brauer, S; Cordaux, R; Casto, A; Lao, O; Zhivotovsky, L. A.; Moyse-Faurie, C; Rutledge, R. B.; Schiefenhoevel, W; Gil, D; Lin, A. A.; Underhill, P. A.; Oefner, P. J.; Trent, R. J.; Stoneking, M (2006). "Melanesian and Asian Origins of Polynesians: MtDNA and Y Chromosome Gradients Across the Pacific" (PDF). Molecular Biology and Evolution. 23 (11): 2234–44. doi:10.1093/molbev/msl093. PMID 16923821. ^ Su, B.; Jin, L.; Underhill, P.; Martinson, J.; Saha, N.; McGarvey, S. T.; Shriver, M. D.; Chu, J.; Oefner, P.; Chakraborty, R.; Deka, R. (2000). "Polynesian origins: Insights from the Y chromosome". Proceedings of the National Academy of Sciences. 97 (15): 8225–8228. Bibcode:2000PNAS...97.8225S. doi:10.1073/pnas.97.15.8225. PMC 26928. PMID 10899994. ^ Kayser, M.; Brauer, S.; Weiss, G.; Underhill, P.; Roewer, L.; Schiefenhövel, W.; Stoneking, M. (2000). "Melanesian origin of Polynesian Y chromosomes". Current Biology. 10 (20): 1237–46. doi:10.1016/S0960-9822(00)00734-X. PMID 11069104. ^ Kirch, P. V. (2000). On the road of the wings: an archaeological history of the Pacific Islands before European contact. London: University of California Press. ISBN 978-0520234611. Quoted in Kayser, M.; et al. (2006). ^ a b Pontus Skoglund; et al. (27 October 2016). "Genomic insights into the peopling of the Southwest Pacific". Nature. 538 (7626): 510–513. Bibcode:2016Natur.538..510S. doi:10.1038/nature19844. PMC 5515717. PMID 27698418. ^ Skoglund, Pontus; Posth, Cosimo; Sirak, Kendra; Spriggs, Matthew; Valentin, Frederique; Bedford, Stuart; Clark, Geoffrey R.; Reepmeyer, Christian; Petchey, Fiona; Fernandes, Daniel; Fu, Qiaomei; Harney, Eadaoin; Lipson, Mark; Mallick, Swapan; Novak, Mario; Rohland, Nadin; Stewardson, Kristin; Abdullah, Syafiq; Cox, Murray P.; Friedlaender, Françoise R.; Friedlaender, Jonathan S.; Kivisild, Toomas; Koki, George; Kusuma, Pradiptajati; Merriwether, D. Andrew; Ricaut, Francois-X. ; Wee, Joseph T. S.; Patterson, Nick; Krause, Johannes; et al. (3 October 2016). "Genomic insights into the peopling of the Southwest Pacific - Supplementary Note 1: The Teouma site / Supplementary Note 2: The Talasiu site". Nature. 538 (7626): 510–513. doi:10.1038/nature19844. PMC 5515717. PMID 27698418. ^ "First ancestry of Ni-Vanuatu is Asian: New DNA Discoveries recently published". Island Business. December 2016. Retrieved 11 January 2017. ^ Green, Roger C.; Leach, Helen M. (1989). "New Information for the Ferry Berth Site, Mulifanua, Western Samoa". Journal of the Polynesian Society. 98 (3). Retrieved 1 November 2009. ^ a b Burley, David V.; Barton, Andrew; Dickinson, William R.; Connaughton, Sean P.; Taché, Karine (2010). "Nukuleka as a Founder Colony for West Polynesian Settlement: New Insights from Recent Excavations". Journal of Pacific Archaeology. 1 (2): 128–144. ^ Bellwood, Peter (1987). The Polynesians – Prehistory of an Island People. Thames and Hudson. pp. 45–65. ISBN 978-0500274507. ^ "Who were the first humans to reach New Zealand (with map)". Stuff (Fairfax). 22 January 2018. ^ a b Hage, P. (1998). "Was Proto Oceanic Society matrilineal?". Journal of the Polynesian Society. 107 (4): 365–379. JSTOR 20706828. ^ Marck, J. (2008). "Proto Oceanic Society was matrilineal". Journal of the Polynesian Society. 117 (4): 345–382. JSTOR 20707458. ^ Anderson, Atholl (2016). The First Migration: Māori Origins 3000BC- AD1450. Wellington: Bridget Williams Books. p. 20. ISBN 9780947492793. ^ Wilmshurst, J. M.; Hunt, T. L.; Lipo, C. P.; Anderson, A. J. (2010). "High-precision radiocarbon dating shows recent and rapid initial human colonization of East Polynesia". Proceedings of the National Academy of Sciences. 108 (5): 1815–20. Bibcode:2011PNAS..108.1815W. doi:10.1073/pnas.1015876108. PMC 3033267. PMID 21187404. ^ Hunt, T. L.; Lipo, C. P. (2006). "Late Colonization of Easter Island". Science. 311 (5767): 1603–1606. Bibcode:2006Sci...311.1603H. doi:10.1126/science.1121879. PMID 16527931. ^ Hunt, Terry; Lipo, Carl (2011). The Statues that Walked: Unraveling the Mystery of Easter Island. Free Press. ISBN 978-1-4391-5031-3. ^ "The Treaty of Waitangi". The colonisation of New Zealand. Retrieved 20 September 2011. ^ a b Bellwood, Peter (1987). The Polynesians – Prehistory of an Island People. Thames and Hudson. pp. 29, 54. ISBN 978-0500274507. ^ a b Bayard, D.T. (1976). The Cultural Relationships of the Polynesian Outiers. Otago University, Studies in Prehistoric Anthropology, Vol. 9. ^ a b Kirch, P.V. (1984). "The Polynesian Outiers". Journal of Pacific History. 95 (4): 224–238. doi:10.1080/00223348408572496. ^ a b Sogivalu, Pulekau A. (1992). A Brief History of Niutao. Institute of Pacific Studies, University of the South Pacific. ISBN 978-982-02-0058-6. ^ a b O’Brien, Talakatoa (1983). Tuvalu: A History, Chapter 1, Genesis. Institute of Pacific Studies, University of the South Pacific and Government of Tuvalu. ^ a b Kennedy, Donald G. (1929). "Field Notes on the Culture of Vaitupu, Ellice Islands". Journal of the Polynesian Society. 38: 2–5. ^ Van Tilburg, Jo Anne (1994). Easter Island: Archaeology, Ecology and Culture. Washington, DC: Smithsonian Institution Press. ^ Sharp, Andrew (1963). Ancient Voyagers in Polynesia, Longman Paul Ltd. pp. 122–128. ^ Finney, Ben R. (1976) "New, Non-Armchair Research". In Ben R. Finney, Pacific Navigation and Voyaging, The Polynesian Society Inc. p. 5. ^ Davis, Wade (2010) The Wayfinders: Why Ancient Wisdom Matters in the Modern World, Crawley: University of Western Australia Publishing, p. 46. ^ "Polynesian Lexicon Project Online". Pollex.org.nz. ^ Weinberg, L. Gerhard. (2005). Visions of Victory: The Hopes of Eight World War II Leaders p.62-65. ^ Druett, Joan (1987). Tupaia – The Remarkable Story of Captain Cook's Polynesian Navigator. Random House, New Zealand. pp. 226–227. ISBN 978-0313387487. ^ Druett, Joan (1987). Tupaia – The Remarkable Story of Captain Cook's Polynesian Navigator. Random House, New Zealand. pp. 218–233. ISBN 978-0313387487. ^ Wilford, John Noble (June 5, 2007). "First Chickens in Americas Were Brought From Polynesia". The New York Times. ^ Storey, A. A.; Ramirez, J. M.; Quiroz, D.; Burley, D. V.; Addison, D. J.; Walter, R.; Anderson, A. J.; Hunt, T. L.; Athens, J. S.; Huynen, L.; Matisoo-Smith, E. A. (2007). "Radiocarbon and DNA evidence for a pre-Columbian introduction of Polynesian chickens to Chile". Proceedings of the National Academy of Sciences. 104 (25): 10335–10339. Bibcode:2007PNAS..10410335S. doi:10.1073/pnas.0703993104. PMC 1965514. PMID 17556540. ^ Gongora, J.; Rawlence, N. J.; Mobegi, V. A.; Jianlin, H.; Alcalde, J. A.; Matus, J. T.; Hanotte, O.; Moran, C.; Austin, J. J.; Ulm, S.; Anderson, A. J.; Larson, G.; Cooper, A. (2008). "Indo-European and Asian origins for Chilean and Pacific chickens revealed by mtDNA". Proceedings of the National Academy of Sciences. 105 (30): 10308–10313. Bibcode:2008PNAS..10510308G. doi:10.1073/pnas.0801991105. PMC 2492461. PMID 18663216. ^ Lewis, David. "A Return Voyage Between Puluwat and Saipan Using Micronesian Navigational Techniques". In Ben R. Finney (1976), Pacific Navigation and Voyaging, The Polynesian Society Inc.
^ Bryan, E.H. (1938). "Marshall Islands Stick Chart" (PDF). Paradise of the Pacific. 50 (7): 12–13. Archived from the original (PDF) on 2010-08-27. Retrieved 2008-05-17. Gatty, Harold (1999). Finding Your Ways Without Map or Compass. Dover Publications, Inc. ISBN 978-0-486-40613-8. Look up polynesia in Wiktionary, the free dictionary. Not included: Oceanian: cinema, (indigenous) currency, dress, folkore, cuisine. Also see Category:Oceanian culture.